31 October 2012: Different Strokes. 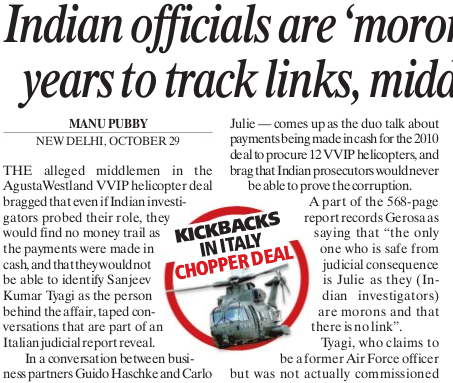 Italian investigators have been on the trail of kickbacks paid to clinch the deal with Indian government for 12 VVIP Augusta West Land helicopters. The stink has been spreading in newspapers here over past few days. Currently two foreigners have been arrested in Switzerland and Italy and charge sheet submitted to a Naples court. Few names of Indians have been mentioned, but no real beneficiaries identified publicly so far. The above boast appears in a taped conversation between Haschke and Gerosa- the arrested duo, who have been under surveillance for long. A K Antony, India’s Defence Minister, has made noises about asking Italy to share results of the investigation. Kickbacks in defence deals is hardly a surprise. This has been a standard operating procedure with political establishment in India since early seventies when reliance on local businessmen for money seemed untenable with socialist rhetoric then in vogue. The foreign contractors for defence supplies on the other hand were considered discreet partners and trusted for secrecy. Since defence procurements are huge, scope for commissions was immense. What is of greater interest here is this bit of conversation: ^^The two Italian consultants, who were extensively trailed, tracked and bugged by investigators, also brag about the fact that the commission paid has been routed through Mauritius and that it would take Indian sleuths years to track it down as they did not know about the Mauritius link. The duo express fear that their lawyer, Gautam Khaitan, may also get arrested if money laundering was probed^^. Incidentally, Gautam Khitan is a managing partner of the law firm O.P. Khaitan and Company. Often it has been commented that Mauritius Route, or the special status granted to Mauritius through DTAA, is an express way or autobahn of corruption. It is often used for *round tripping* whereby ill gotten wealth is rerouted through Mauritius as -* * * * * * *- foreign investment. There is no need to show who is the real investor as he safely hides behind global behemoths that front as Foreign Institutional Investors in India. Mauritius Route has exceptional advantage. It launders money snow white. It also shields it from tax-man. Is it then surprising that the Italian duo is well versed with advantage Mauritius? Our own Income Tax department has commented on Mauritius Route, when it asked Vodafone to pay the withholding tax it should have deducted from payments made to Hutchinson to acquire its telecom business. Its notice was upheld by Mumbai High Court only to be set aside by Supreme Court. The *explanations* that Finance Ministry issued to *clarify* provisions of Income Tax act, which would have undone the apex court judgement were promptly withdrawn when P Chidambaram replaced Pranab Mukherjee, who found himself in Rashtrapati Bhavan to cool his heels. Indian officials are not morons. Either they pretend to be moron when suitably incentivised or are made to appear like morons under pressure. P Chidambaram in his third avatar as finance minister is making a third attempt to shore up business sentiments by floating hot air balloons. 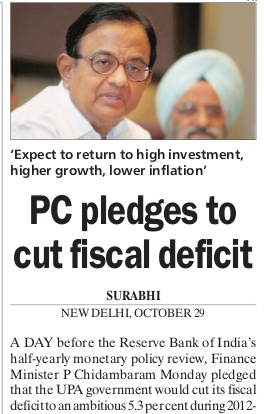 He pledged ^^that the UPA government would cut its fiscal deficit to an ambitious 5.3 per cent during 2012-13 from 5.8 per cent during the previous fiscal, and further reduce it to 4.8 per cent in 2013-14 despite the compulsions of general elections due that year. In an apparent attempt to make the goalposts appear credible to the central bank, Chidambaram also promised to amend the Fiscal Responsibility and Budget Management Act to make the targets inviolate^^. He is a brave man indeed to make these claims. But then politicians can afford such bravery because they are not accountable. His is an ill concealed pressure tactic to have the Reserve Bank of India to ease its anti-inflation stance and soften the interest rates. Though he is darling of the Dalal Street and Business Community, the Sensex showed an insignificant gain on Monday and dropped over 200 points on Tuesday. Rupee too lost 52 paise and 23 paise to a dollar on consecutive trading days. His hot air balloons had earlier managed to help appreciate rupee from 54-55 range to 52-53 range, but rupee is back where it was in just a few weeks. RBI refused to buckle, and its cautious stance against core inflation drew praise: ^^Economists and analysts today described the RBI decision to leave the policy rates unchanged as “prudent” and opined that sticky inflation should remain the primary concern of the Central bank^^. Chidambaram was upset and talked like a jilted lover: ^^Growth is as much a challenge as inflation. If government has to walk alone to face the challenge of growth, then we will walk alone^^. The record of RBI has consistently been praised, especially for its cautious approach that saw India through relatively unharmed from the 2008 US financial meltdown. He also had to give this pep talk in public because IMF officials, the hatchet men of Global Capital, are in town to take Finance Ministry to task in private for their failures to do what they knew was expected of them. 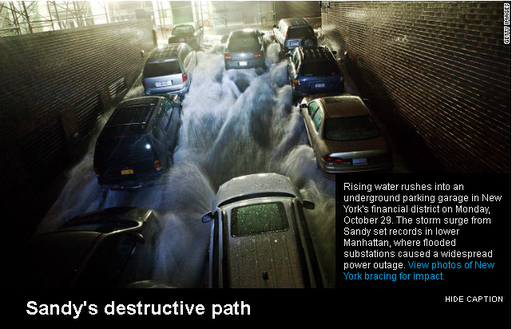 US business leaders were worried about the effects of super storm Hurricane Sandy on GDP growth. The damages caused by Sandy are expected to dethrone the top of the list Hurricane Katrina that reportedly consumed USD 100 billion or at least Hurricane Irene. Would it throw US economy into recession -lost work days, flights, infrastructure and property damage,- that showed some anaemic signs of improvements? This is the worry. But then some sections of business exuded quiet confidence that things would in fact look up. People would have stocked up things to weather the hurricane and would have set the retail cash counters ringing. Then the clean up as well as reconstruction would open opportunities for construction industry. Like Naomi Klein pointed out in her book, those with strong stomachs know how to profit even from disasters. Salman Khurshid as law minister was under fire over the alleged irregularities in the trust run in the name of his illustrious grand father. He was caught on a video clip using the language of a street ruffian to threaten Arvind Kejariwal, an anti-corruption crusader and his tormentor, in a private gathering of his supporters. Man Mohan Singh probably thought that his *tough talking persona* would come handy in silencing Pakistan and China, and promoted him as Minister of External Affairs. 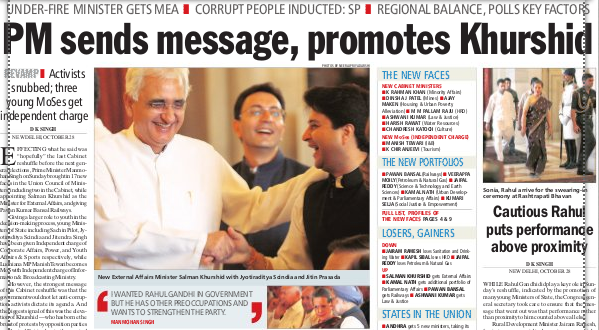 Hopefully, Khurshid’s angst and bravado would now be directed externally rather than internally. Indians may though be forgiven if they think that they are ruled by Maun Mauji Singh [मौन मौजी सिंह]. Someone who keeps his silence and rewards questionable behaviour. 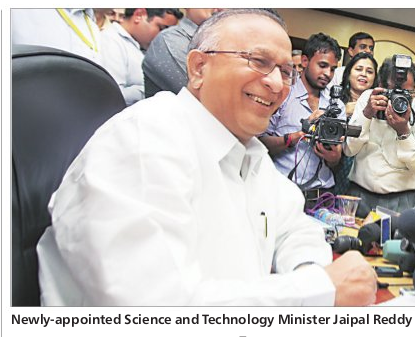 Jaipal Reddy was shunted out of a ministry that presides over a coveted natural resource and national asset- petroleum. Exactly as sometime back Mani Shankar Aiyar was replaced by Murali Deora, friend of Mukesh Ambai. Reddy misunderstood that Krishna-Godavari basin gas belong to the nation and not to Reliance Industries, who had refused to submit to CAG audit and wanted the terms of production sharing agreement and contract signed with government to be favourably changed to suit its interests. Reddy foolishly refused, and had to make way for Virappa Moily, who of course is expected to deliver what Reliance desires. Sharad Yadav, president of Janata Dal [U], was unnecessarily perturbed by the sudden epiphany he had: ^^I am totally perturbed that during our life time we would see such period when a corporate house like Reliance becomes even more powerful than the government. According to Yadav, RIL requested to increase price from $4.2 per unit to $14.2 per unit, an increase of around $10 per unit. If agreed to, it would mean increase in profit of Reliance by Rs. 22,000 crore in two years, resulting in the same increase in subsidy from the government, even at the low production level projected by Reliance(only 27 units this year and 18 units next year). This was resisted by the ministry and an EGoM note recommending rejection of the proposal was circulated^^. If Yadav were to read the book, Shock Doctrine: The Rise of Disaster Capitalism, then he would be much relieved to know how even the mighty US government has to bow to the wishes of mightier Transnational Corporations and global capital. Even in USA the key secretaries in the administration [Treasury, Defence], equivalent to our cabinet ministers, are filled by Corporate appointees. One shouldn’t lose sight that there is a British Petroleum behind Reliance Industries’ KG Basin project. 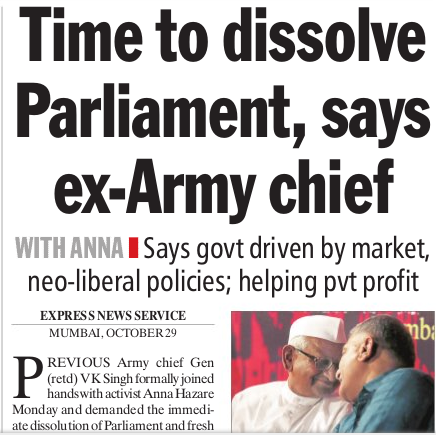 Retired General V K Singh made another round of uniting with Anna Hazare. He said that present UPA-II government is driven by market and neo-liberal policies; and has private interests and profits uppermost on its agenda. Though his reading of the situation is correct, his prescription is not. His innocent faith that dissolution of parliament and early fresh elections would solve the problem is really touching. Is he stranger to the role money plays in elections? People may choose their representatives from this or that political party; but, finally, businesses get to choose the policies that are made. In fact, Corporates dictate the policies. Singh has to only ask Chidambaram, Jaipal Reddy or Sharad Yadav to know the reality.